Can I still buy travel insurance for Winter Storm Harper? Unfortunately, it is too late to buy a travel insurance policy with coverage for Winter Storm Harper. Winter Storm Harper became a named storm on Wednesday, January 16, 2019. In order for travel insurance to cover the winter storm, a traveler must have purchased their policy before it was named on January 16. Travelers who bought a policy before the storm was named are eligible for all of the benefits included within their policy if Harper impacts their trip, including Trip Cancellation and Travel Delay benefits. Can I cancel my trip if Winter Storm Harper is affecting my destination? 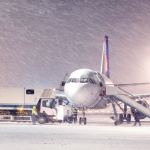 Travelers may be covered to cancel their trip if Winter Storm Harper has a serious impact on their trip, as long as they bought their policy before the storm was named on January 16, 2019. What if my flights are delayed because of the storm? If a traveler’s flights are delayed due to Winter Storm Harper, they may be covered under the Travel Delay and Trip Cancellation benefits. The coverage that is triggered depends on the length of the delay. In the event inclement weather causes a delay that lasts between 3 and 12 hours, the Travel Delay benefit can reimburse the amount spent on meals and accommodations during the delay. Some policies with this coverage can also cover the additional expenses incurred for a traveler to catch up to their trip. If the delay exceeds 12 hours, Trip Cancellation coverage may become available, depending on the policy. However, some policies require a delay of 24 or 48 hours before cancellation coverage is available. What if I can’t get to the airport due to dangerous road conditions? While flight delays and cancellations can be covered by travel insurance, choosing not to travel because the roads are bad is not a covered reason for a traveler to cancel their trip under Trip Cancellation. Simply not wanting to drive in poor road conditions in not covered by standard Trip Cancellation policies. Only policies with the Cancel For Any Reason upgrade can refund travelers who don’t want to travel because the roads are bad. This upgrade allows travelers to cancel for a reason that is not otherwise covered, such as not wanting to drive in the snow, but they must cancel at least 2 days before their departure date. This upgrade typically increases the cost of a policy by about 40%, and is only available for 14-21 days after a traveler’s initial trip booking. It requires travelers to insure 100% of their trip cost, but can only reimburse up to 75% of their total trip cost.